Inequality is frequently in the news. A new study puts an interesting spin on this now-familiar topic: rising health costs are a significant reason for wage inequality. The cost of employer-provided health insurance is a larger share of lower-paid employees’ total compensation than it is for the people higher up in the organization. Since insurance costs have been increasing faster than total compensation, squeezing out pay raises, the nation’s lowest-paid workers feel it most. 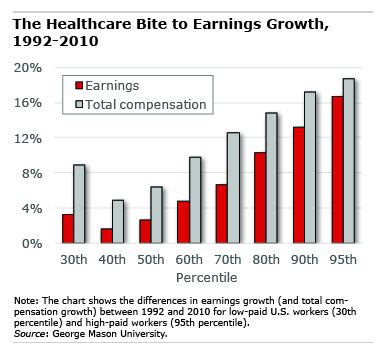 For people with earnings at the 30th percentile of all U.S. workers, total compensation, including the cost of employer health insurance as well as actual earnings, increased by just 9 percent in inflation-adjusted dollars between 1992 and 2010, according to data in a new study by Mark Washawsky at George Mason University’s Mercatus Center. Total compensation for high-paid workers at the 95th percentile grew 19 percent. However, the rapidly rising cost of employer-provided health insurance took a larger bite out of lower-paid workers’ earnings – and out of their take-home pay. Inflation-adjusted earnings at the bottom rose by just 3 percent over the 18-year period, compared with a 17-percent increase at the top. Washawsky correctly notes that employer-provided health insurance is a form of compensation that is valuable to all workers, regardless of how much they earn. The problem for workers living paycheck to paycheck is that they pay their day-to-day bills out of what’s left in that paycheck. That’s where you’ll find the inequality from rising healthcare costs. To stay current on our Squared Away blog, we invite you to join our free email list. You’ll receive just one email each week – with links to the two new posts for that week – when you sign up here. Everything that is purchased is a larger share of lower-income individuals’ paychecks – insurance, bread, shoes, transportation, movies….you name it….everything. For me, that was my incentive to invest in myself, improve my skillset, strive for jobs offering higher and higher incomes – and move away from living paycheck-to-paycheck. Once again, it’s all about personal choices. The discrepancy in the employer-provided health-insurance is alarming. It is gradually becoming difficult for the lower-income group individual to afford quality healthcare. I believe that under the Affordable Care Act there are limits to how much more senior workers can be charged, compared to younger workers. That may sound good, but it means that the young and healthy are subsidizing the old and less healthy. The young are also typically earning lower incomes. Thus the problem addressed in this article is aggravated by an unfortunate feature of the ACA: the young and generally poorer must subsidize the older and generally wealthier. Reverse Robin Hood?